The Business Consultant Agreement is used by a ‘Company’ to employ a ‘Consultant’ for his services and where the company agrees to pay his fees in return for the consultation. It states that the company has employed the consultant to perform a set of services and duties as per the Terms and Conditions set forth in the agreement. The consultant will have two spend an approximate amount of time in fulfilling the obligations of this contract and that time can change from day to day or week to week. The consultant will be paid at fixed rate in dollars per hour as payment for the services provided. Both the parties agree that the consultant is an independent contractor in the performance of its duties under the contract and will be responsible for paying all taxes including federal, state and local taxes that arise out of the services provided by the consultant. Any information that the consultant against during his term as business consultant for the company is expressly confidential and will not be shared with any other third party without written permission of the company. 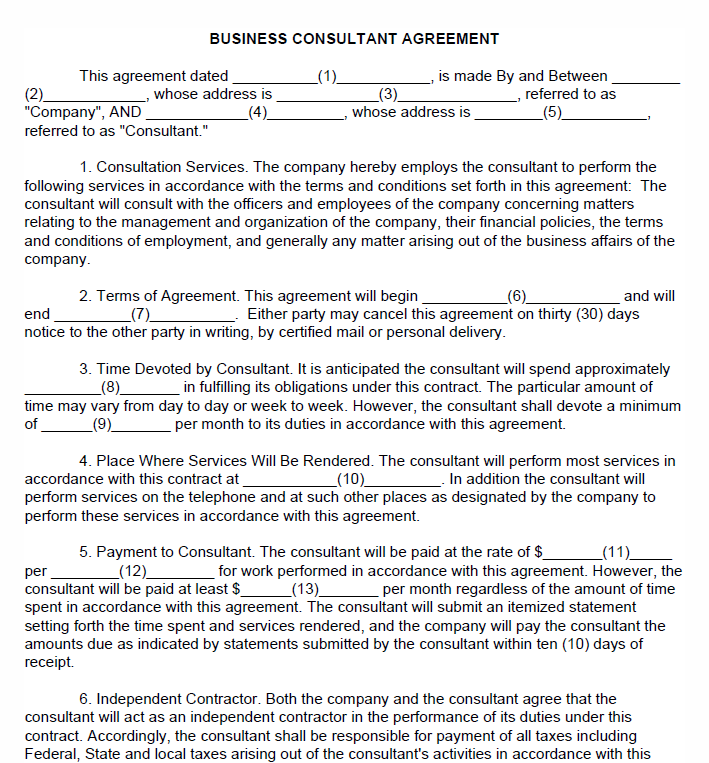 This Business Consultant Agreement is a generic template and applicable is all states, just modify the contents as per your requirements. This document can easily be downloaded by clicking on the download link below.